Since the gift of the Eucharist is so splendid, as we saw in the last article, we should use it as Our Lord desired, that is, for all the needs we have in our spiritual life. 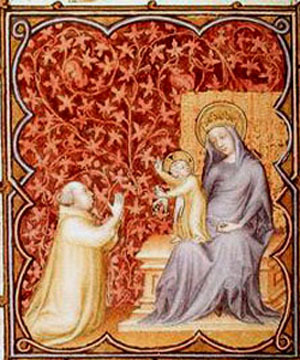 This corresponds to the third point of St. Ignatius meditation: the utility of the gift. Thus he prepares himself for Communion, recollecting himself and meditating on this point before receiving Our Lord. Another person needs help to be pure. Our Lord Jesus Christ is purity itself. His Blood is called “the wine that generates virgins.” We know that no one can maintain purity without a grace that comes from Him. We may ask for everything that we need. He is in the Eucharist to help us with all our necessities. We should ask without timidity or fear. To make such a request is a consequence of the last point St Ignatius makes. 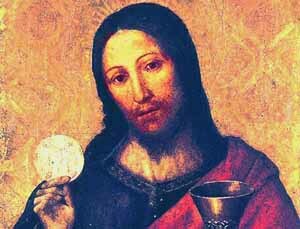 The thoughts he offers on the Eucharist are so profound that before Communion, it suffices to take one of his points and concentrate seriously on it for a Communion to be well made. When preparing for Communion, it would be good to have his entire meditation at hand to read. Then, we could choose one point to ponder. It is the minimum you could do. Or else you might pour him an excellent liqueur and say, “I know that this is inadequate, but I ask you to accept this drink. It is a meager expression of what I would like to do for you.” The most elementary gratitude calls for this. These reflections touch the deepest parts of a soul. If a person takes them seriously, he will be persuaded of what they say. 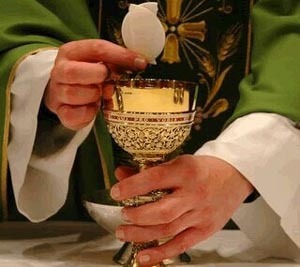 For, in final analysis, if we believe that the Holy Eucharist is the Body and Blood of Christ, which we are receiving, how can we deny the validity of this reasoning? It could not be more persuasive. How good is to have this thought of St. Ignatius and keep it with us during the day to remember once in a while! We might read it again and consider: “Today Our Lord gave Himself to me. In retribution, I am asking Him the grace to deliver myself entirely to Him. Hence, I make this or that sacrifice, I offer something that is hard for me to give up, etc." These are normal attitudes taken by a person who does not lose sight of the Communion that he received that day and the one he will receive tomorrow. This is how we prepare ourselves to become truly Eucharistic souls. You see that this kind of meditation requires much seriousness. Today, unfortunately, it is not common to hear such things. But remember, this is from St. Ignatius of Loyola. It is an extraordinary teaching, approved by many Popes on many occasions. Now imagine a man who lives in a country where there is a King. The King gives this person a principality. 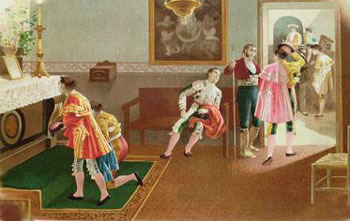 Later on, that man needs some small favor from the King, for example, that the King should command someone to give him a vaccination certificate. Should he be afraid to ask the King for this small thing? Of course not, since he gave him a principality, certainly he will give him this much smaller thing. One should have a great largesse of soul and not fear to ask for much. He should think to himself, “Once He gave me so much, will He not give me something much smaller?” One should, therefore, make great requests, abundant requests. This is how we prepare to live our lives in function of Our Lord Jesus Christ in the Eucharist. All this is profoundly serious, it is true, but these talks are an invitation to seriousness. Do you know why? Because if we are not serious in this life, when we will die we will have the greatest shock imaginable. For then we will be face to face with the infinite seriousness of God. Then He will say to us, “I visited you daily for so many years. Every day I gave you the grace of desiring My visit. Every day you corresponded to that grace of going to Communion. But you were never serious when you received me in that visit I made to you. You received me without reflecting upon what it meant, not taking the consequences of that visit." And how will we respond? We will hang our head and await the punishment that can well be, at the least, a long purgatory for having received Our Lord with such carelessness. You can understand, then, how worthwhile it is to meditate on this. It would be good for us to have these points at hand at the time of our Communions. For the Eucharist must be the sap of our spiritual life.